The roar of a Nissan Sentra draws a sigh of relief from Katherine McClure. The exhaust lifts a weight off her shoulders. Her name hasn’t been on the title of a car since she escaped her abusive ex-boyfriend in 2015, until local businesses teamed up with the YWCA Rock County to hand her the keys to her new silver sedan Friday. 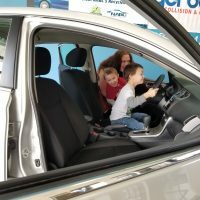 Brian Sullivan, the manager at Gerber Collision and Glass in Janesville, organized the giveaway with Esurance through the Recycled Rides program, which repairs totaled vehicles and donates them to families in need. Katherine’s road to transitional housing with her three young boys was rough enough. Not having her own car only made it worse. Now she doesn’t have to rely on public transportation to get to work. YWCA Rock County teamed up with Gerber Collision Center and Esurance to give a free car to a local family in need. We'll have the full story on WCLO.